Guggenheim Museum Bilboa is the most important attraction in Bilboa. Indeed, it is largely responsible for the city's rescue from the post-industrial abyss it had fallen into during the second half of the 20th century. 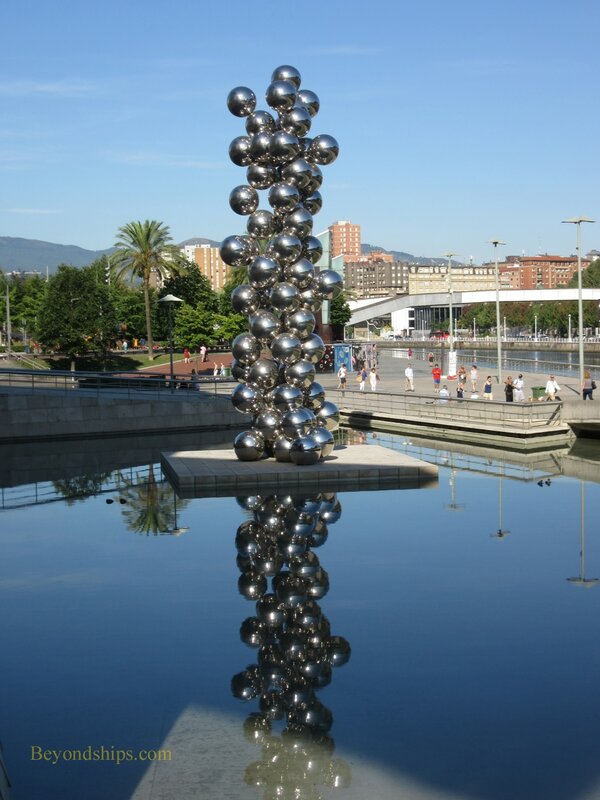 The building sits in a park-like area along the banks of the Nervion River. 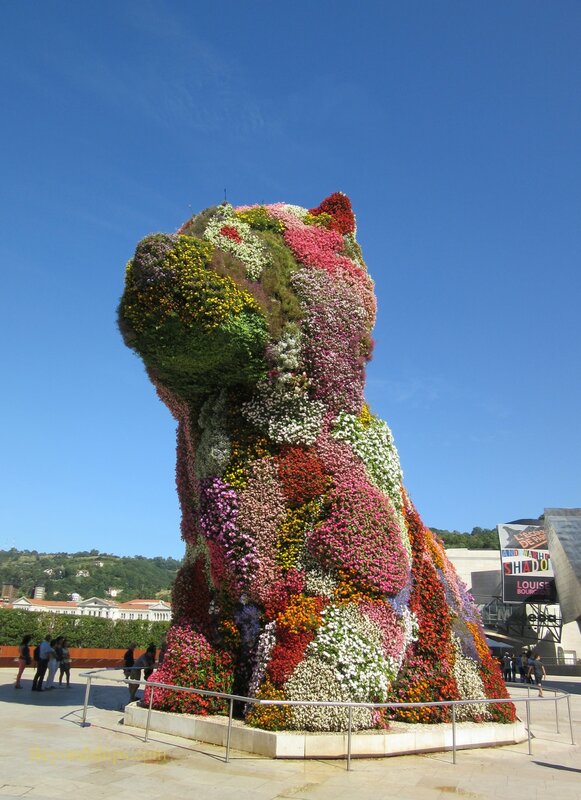 Broad sidewalks, plazas, trees, fountains and large artistic constructions punctuate the area. At the center of it all is the now well-known flowing building which shines silver in the sunshine. The atmosphere is new, clean and looks toward the future. This was not always so. At one time, the area was a busy industrial zone dominated by shipyards. It was quite prosperous and feed the economy of the area. However, in the second half of the 20th century, demand for Bilboa's ships and ship repair dried up. The area became a polluted industrial wasteland. Meanwhile, the Solomon R. Guggenheim Museum in New York had outgrown its landmark Frank Lloyd Wright building on Fifth Avenue. Under the leadership of director Thomas Krens, the Guggenheim was looking to establish satellite branches in buildings funded by foreign governments. 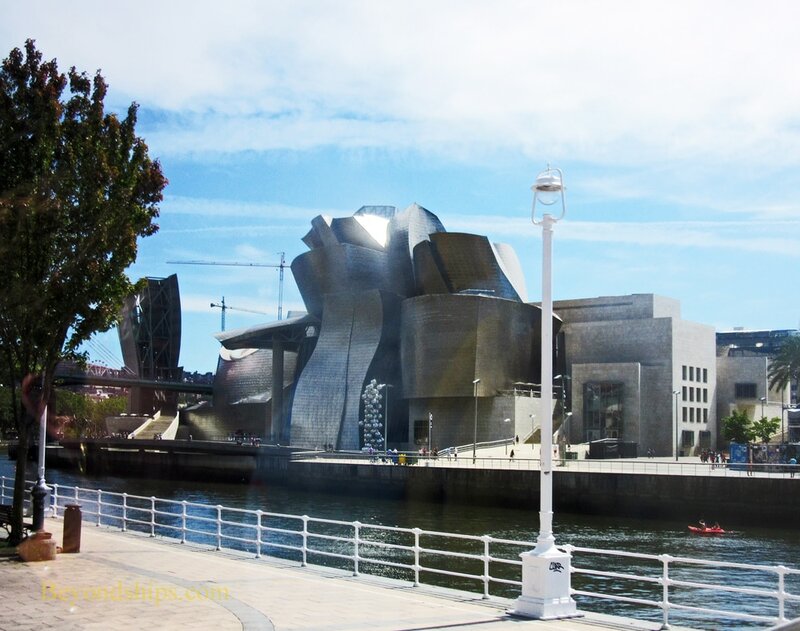 Seeing this an opportunity to stimulate the revitalization of Bilboa, the Basque region government contacted the Guggenheim and offered to build an art museum if the Guggenheim would operate it. In addition to providing $100 million to construct the building, the government agreed to create a $50 million acquisitions fund and to subsidize the operating cost of the museum. 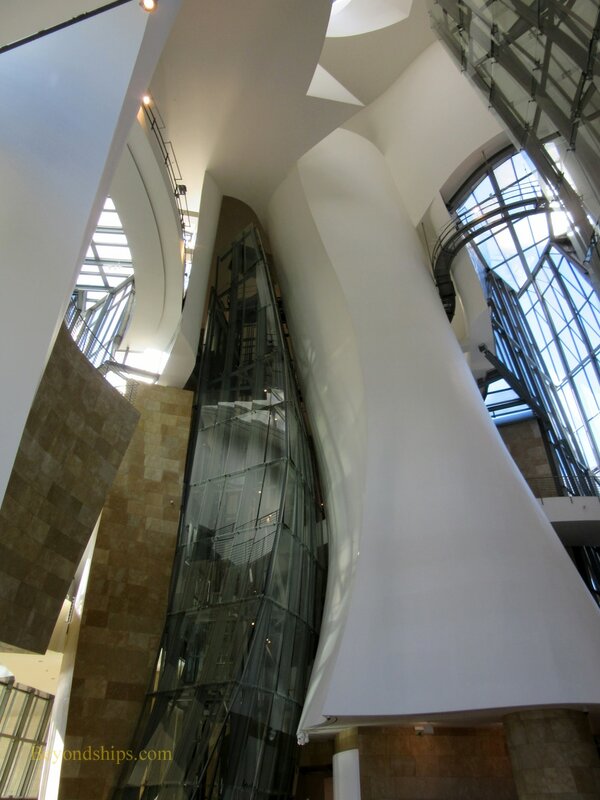 The Guggenheim selected Canadian-born, Los Angles-based Frank Gehrey as the architect for the new building. High tech software previously used to solve aerospace problems was used to bring his curving design into reality. To provide the skin for the building, Gehrey used 33,000 thin sheets of titanium, which not only provided strength but also caused the buildings color to change depending upon the light and the weather conditions. The structure also utilizes limestone and glass. It covers 260,000 square feet of which about 120,000 is exhibit space. Construction began on the museum in 1993 and continued to 1997 when the museum openned. Perhaps surprisingly, the museum was built on time and within its budget. It was an immediate hit and has acted as a magnet bringing visitors to Bliboa. The building is so spectacular that it overshadows its contents. Visitors can walk around the entire building and gain different perspectives throughout the journey. It is situated on the slope of a hill and so at different points you are looking up at it while at others you are looking downwards. Inside, there are cavernous spaces with suspended walkways. Natural light flows down from the skylight in the atrium. The walls are devoid of artistic embellishment and decoration. Rather, they are plain, relying on the natural character of the materials for interest. The exhibits include the museum's permanent collection, pieces from the Guggenheim collection that are exhibited on a rotating basis and themed temporary exhibits. The works are primarily 20th century, focusing on abstract and conceptual art. Large amounts of space are devoted to conceptual pieces that are monumental in scale. Above: Tall Trees and the Eye by Anish Kapor sits on an island in a pool beside the building. 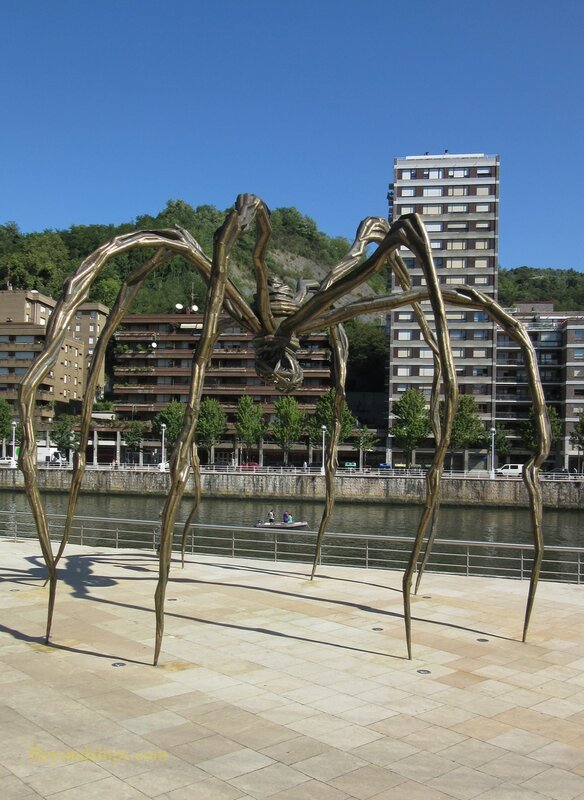 Right: Even the Puente La Salve adjacent to the museum has become a work of art. 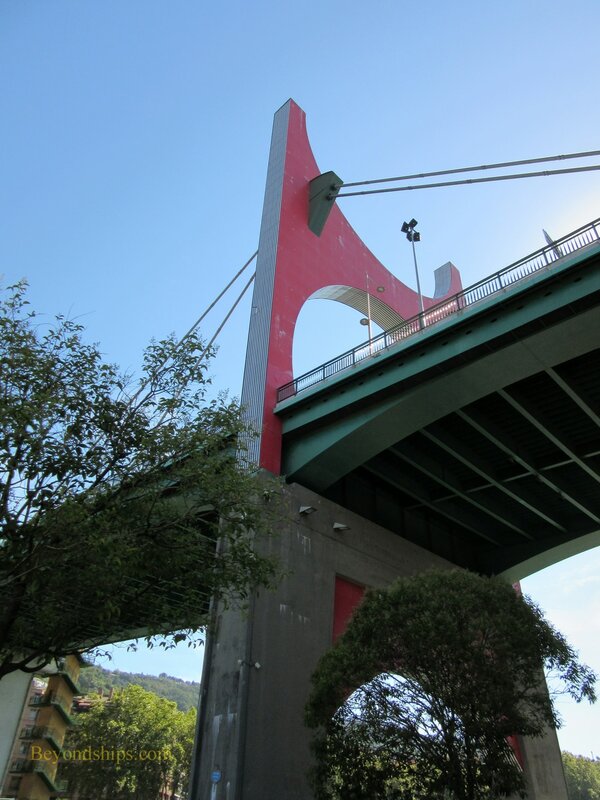 To mark the Museum's 10th anniversary, Daniel Buren's Arcos rojos / Arku gorriak was installed on the bridge. Above: The exterior of the building is not uniform in appearance but rather changes depending upon your viewing angle. ​Below: The interior is just as unconventional as the exterior. The area around the building contains unconventional monumental sculptures including Jeff Koon's Puppy (above) and Louise Boureois' Mamman (below).